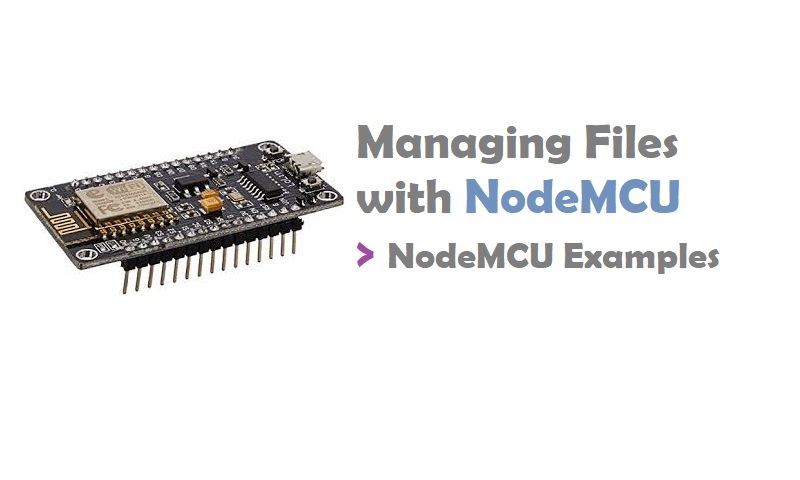 In this article, We learn “Managing Files with NodeMCU”. NodeMCU is most popular development board for IoT projects. NodeMCU is an open source IoT platform. It includes firmware which runs on the ESP8266 Wi-Fi SoC from Espressif Systems, and hardware which is based on the ESP-12 module. The term “NodeMCU” by default refers to the firmware rather than the development kits. The firmware uses the Lua scripting language. It is based on the eLua project, and built on the Espressif Non-OS SDK for ESP8266. It uses many open source projects, such as lua-cjson and SPIFFS (SPI Flash File System). NodeMCU Firmware has inbuilt support for file operations using SPI Flash File System (SPIFFS), so you can perform operations like upload, delete, list, compile, run, etc directly on ESP8266 Module. SPIFFS allows data and scripts to be written and read from the flash memory in form of files instead of raw memory locations. Lua source program can be saved, compiled and run directly on NodeMCU Module. Within NodeMCU, the file module is used by Lua scripts to interact with the SPIFFS filesystem. It means that we perform the file operations using simple Lua based NodeMCU functions/commands. To create a new text file you can use following script. Maximum filename length is 32 characters. NodeMCU flasher is a firmware programmer for NodeMCU DEVKIT V0.9. You can use it to program NodeMCU DEVKIT or your own ESP8266 board. You MUST set GPIO0 to LOW before programming, and NodeMCU DEVKIT V0.9 will do it automatically. It will be cross platform and open source. node.restart()  -- this will restart the module. -- re-direct output to function s_ouput. I hope you like this post “Managing Files with NodeMCU”. Do you have any questions? Leave a comment down below!